An individual device you work on. You’re familiar with all of its particular failure modes. You manage the “herd” of devices as a group. Before we moved to automating network hardware failure resolution, we were stuck handling our networking equipment like pets, with an eye toward what made it unique, rather than as cattle, with an eye toward what made it a commodity. We needed to make it easier not to custom-manage all these networking devices. Our initial automation design aimed to turn our fleet into cattle by providing a common interface for interacting with networking equipment. Specifically, we used the underlying primitives to implement a higher-level interface for performing common operations—in this case, the basic operations of a line card in a network device, regardless of vendor: “Bring it online,” “Take it offline” and “Check the status.” We defined the following interface for a line card, using the Go programming language. We then realized that we could apply the same interface to many hardware components—for example, a fan. For certain vendors, the Online() and Offline() functions did nothing, because those vendors didn’t support turning a fan off, so we just used the interface to check the status. We had the option to extend or repurpose existing automation systems owned by our software management teams to meet our needs. We had to carefully consider whether to use those systems or build our own, potentially duplicating work if we chose the latter. Ultimately, we built our own automation because the other systems were understaffed. Trying to extend their tools would have disrupted other teams’ project work and delayed our own project. We haven’t yet fully automated our hardware replacement workflow. Doing so involves troubleshooting hardware issues with vendors and persuading them that each individual failure merits a device or component replacement. We work around this gap in our automation by keeping spares on site for use with our repair automation, and handling the vendor workflow portion of the process separately and mostly manually through our NOC. We are currently working toward a fully automated vendor interaction with our vendor partners. We can measure the hours our automation saves engineers using Google’s production change logging service, which all internal tools use to record changes made to the production environment. The service logs changes made by tools manually invoked by engineers as well as tools that provide end-to-end automation without manual input. Thus we can compare how long each network repair action used to take when performed manually vs. the number of repair actions that are undertaken by today’s fully automated system. These two data sets allow us to calculate the total time savings from automation. 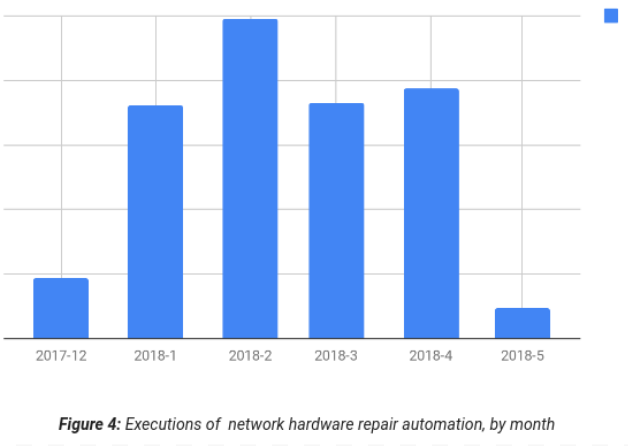 As shown in Figure 4, network hardware repair automation saves us hundreds of hours every month. Tackle the biggest sources of toil first, and don’t try to solve all problems at once. Carefully consider whether to enhance existing tools or build new ones. Even if you can partially repurpose another team’s work, would creating a tool from scratch actually make more sense cost- or resource-wise? Take a design-driven approach. Iterate on the design, starting small and iterating quickly. Don’t try to design the perfect approach from the start.